For my fellow marketers, I wrote a piece in the Credit Union Times about how to stretch your 2015 marketing budget. Marketing budgets seem like the first thing to get cut when businesses tighten their belts, so I have a few strategies for coping. On October 10, I spoke on a panel at the Oregon Business Education Association conference, held at the Kennedy School in Portland, Oregon. I was on a panel designed to help business education teachers understand the varied types of workplaces they will help students prepare for. The panel was fantastic, featuring both small businesses and large corporations, featuring CEOs and middle-management, and featuring me! I was the youngest person on the panel and the only millennial. Overall, I believe the teachers really got a thorough idea of how varied workplaces can be: some people on the panel were still not allowed to access social media at their workplace, while others were in constant communication with coworkers via Twitter and FourSquare. The entire conference touched on the subject of inter-generational workplaces, and much attention was given to millennials. I don’t think I was the only millennial in the room, but it felt very weird to hear speakers talk about my generation. 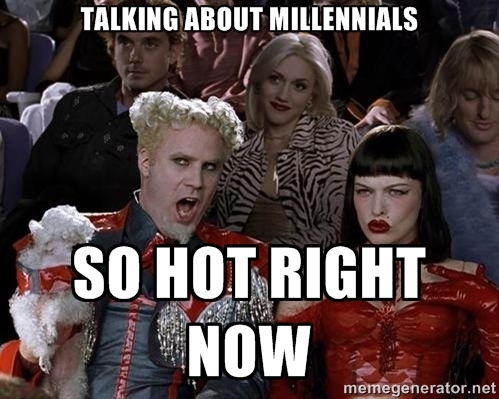 Most of it focused on differences millennial workers bring to the workplace, but there have been so many anti-millennial think-pieces out there that it’s difficult not to be wary of anyone who isn’t a millennial talking about how “we” are. Especially when many of these pieces discuss millennial attributes as negative just because they differ from previous generational work styles. Different shouldn’t automatically be negative, and I view some attributes (like a demand for more work/life balance) as positive ones. So how can credit unions and banks use the experience economy to woo young adults? Shift from thinking about products and think about the banking experience as a whole.